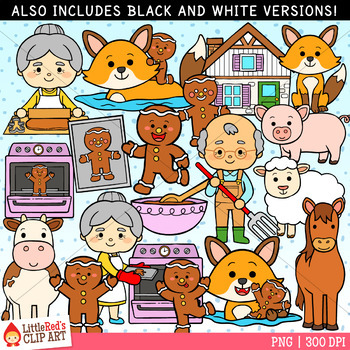 A cute collection of clip art for the story of the Gingerbread Man! 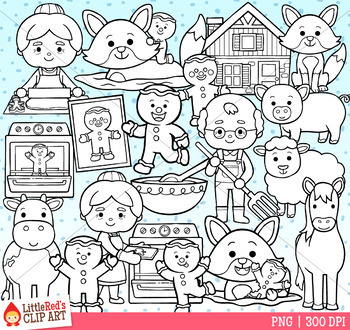 Includes the Gingerbread Man in different poses, the old woman baking, the old man, a pig, horse, sheep and cow, the fox and a house. This clip art set has been created for personal, educational, and small-business (homemade/handmade items) use. When using Little Red's Clip Art in distributed products, please make sure the artwork is secured and that a credit to our shop is included somewhere in/on the product. If you have concerns about what you may and may not do with our clip art collections feel free to contact us with your questions! Follow us on Facebook! | Follow us on Instagram!